For three years, 1906-1909 Lt. Giuseppe “Joseph” Petrosino headed what became known as the Italian Squad of the New York Police Dept. As a detective, Petrosino focused on fighting the Italian criminal element in New York’s Little Italy, a group known as La Mano Nera or the BLACK HAND a forerunner to the Mafia. 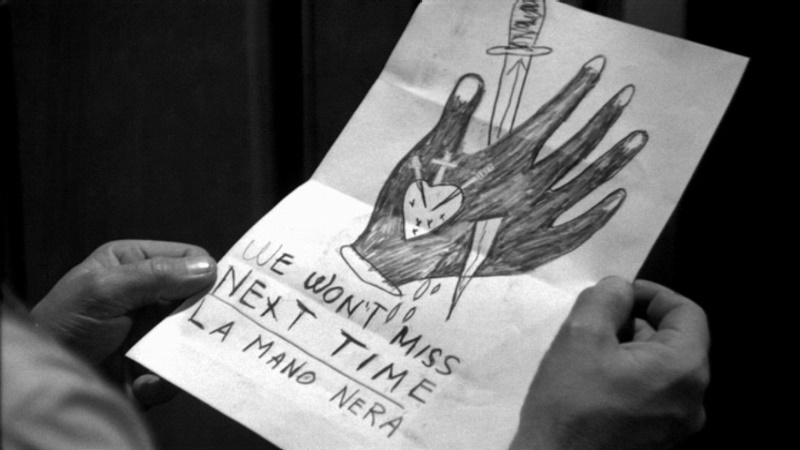 The Black Hand began in the late 1890’s, a hoodlum by the name of Ignazio “Lupo” Saietta was one its original organizers. Sainetta was big on extorting money from local Italian businessmen. He even penetrated the Union Scilciania, a charitable organization for newly arrived Sicilian immigrants in America. After obtaining a search warrant, Petrosino with other law enforcement officers found more than 60 bodies hidden in the Union Scilciania building. Most of the bodies were chopped up into pieces. After this Petrosino became even more determined to bring the Black Hand to justice. He came up with the idea of forming an all Italian member police squad hoping to win the confidence and help of the Italian community in capturing these criminals. Petrosino and his men went on a rampage; more than 500 hundred Italian criminals were deported back to Italy. Many others went to jail. In 1909 Petrosino went to Italy as part of a joint investigation between the police and immigration officials. In Palermo he examined police files trying to identify criminals who could be deported as well as the real identities of many who changed their names. He also was searching for a connection between the Italian Mafia and the Black Hand back in the states. He came real close because Petrosino was shot dead in the Piazza Marina under the statue of Garibaldi after receiving an anonymous tip with promising information. Credit for the assassination generally is given to Don Vito Casico Ferro who had various run ins with Petrosino in New York before he returned to Palermo where he would become capo dei capi. When Petrosino’s body was shipped back to Little Italy in New York more than 200,000 people came by to pay their respects. From the late 1950’s through the early 1960’s the largest wave of gangster films were produced since the golden age of the 1930’s. Though mostly low budget, within a span of six years we saw ”Baby Face Nelson”, “Machine Gun Kelly”, “Al Capone”, “The Purple Gang”, “Young Dillinger”, “Bonnie Parker Story”, “The Rise and Fall of Legs Diamond”, “Portrait of a Mobster”, “Mad Dog Coll”, “King of The Roaring Twenties”, “Murder Inc.”, “The Scarface Mob” (two episodes of the TV series The Untouchables released as a feature film) and “Pay or Die.” Of all these films, “Pay or Die” and “Murder Inc.” are arguably the most important of the group and “Pay or Die” is the only one of the films to focus on a heroic American figure in fighting crime. 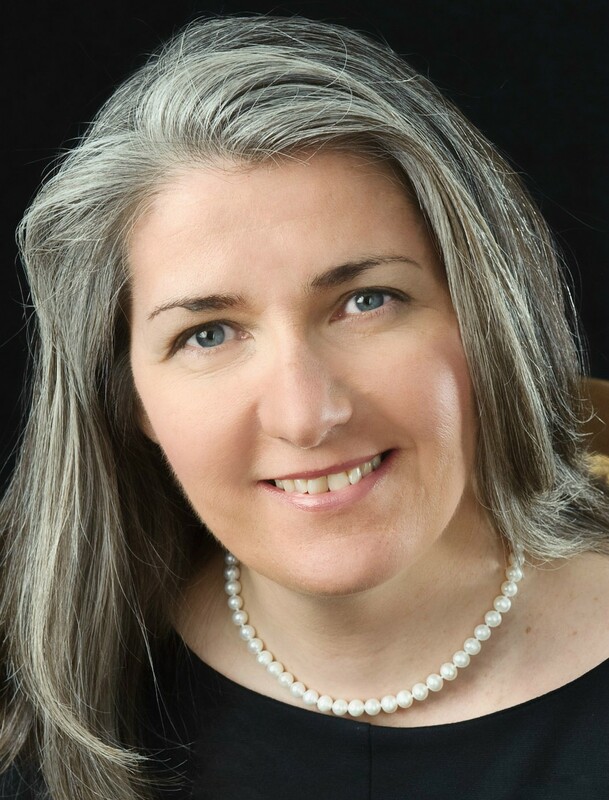 “Pay or Die” is a vivid account of the life and times of Giuseppe Petrosino. Like most film biographies liberties have been taken but the overall story is true, including an extortion attempt on Opera star Enrico Caruso as portrayed in the film. Though obviously filmed on a studio lot, the film reflects an accurate look at immigrant life at the turn of the 20th Century. Italian immigrants were pouring into the United States mostly from the poorer parts of Italy, and the poorest part was Sicily. Many of these families settled in New York, in what became known as Little Italy. The Black Hand preyed on the Italian community extorting money from store owners. If they didn’t pay, storefronts were blown up or worst the owners were brutally murdered. A note would be left with the body, a black hand imprinted on it as a warning to others. 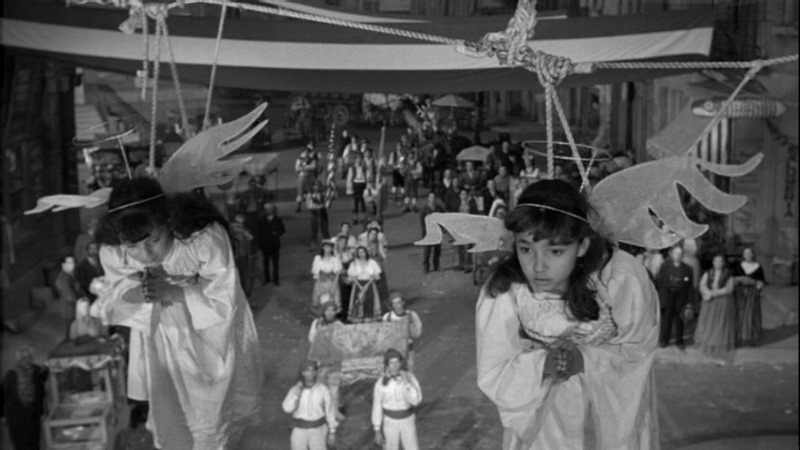 The film opens up with the celebration of the Santa Rosalia Street Festival which includes a harrowing scene showing two young girls, about nine of ten years old, dressed as angels. The two girls are seen suspended on two clothes lines that stretch across the street between two tenement buildings. They are “wheeled” to the center of the street, two or three stories high and recite a pray. Down below, the crowd is thrilled, the girls parents proudly watch, Lt. Petrosino roams the crowd as does a well dressed though slimy figure who we watch climb up to an apartment adjacent to the clothes line. He pulls out a switchblade and cuts one of the clothes lines sending one of the little girls crashing down to the street below demonstrating the Black Hand’s persuasive measures to ensure people will pay. In another example of their brutal methods three thugs come into the bakery of Papa Saulino, who is “late” in paying. The men wreck the place, tie him up and slide him into the bread oven to think over his decision about whether to pay or die. Later Saulino’s daughter (Zohra Lampert) and eventually, Petrosino wife, is attacked one evening on her way home from night school. She is threatened, her dress ripped and one of the thugs with black paint or ink on his hand presses a handprint over her left breast, a message to her father that his whole family is vulnerable. “Pay or Die “provides a tough look at the early days of the Italian criminal element in the United States and how they as predators, extorted and terrorized their own people, and one man’s attempt to fight back. The film uses the phrases “Mafia” and “Mafioso” at a time when J. Edgar Hoover only just began to admit that the Mafia even existed (maybe he watched this movie). 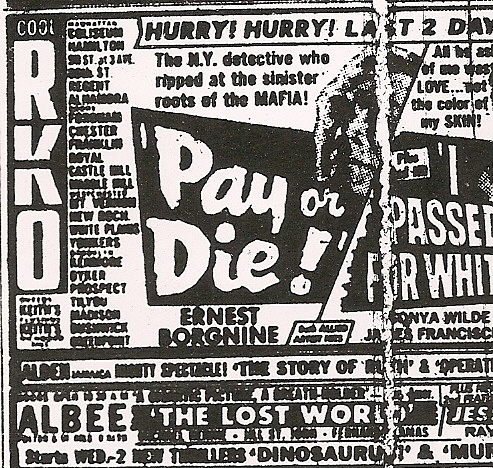 Interestingly there was no outcry from the Italian-American community when the film came out, unlike some twelve years later when Francis Ford Coppola’s “The Godfather” hit the screens and used these same phrases, possibly because unlike the high profile Coppola film, “Pay or Die” came and went into theaters without much fanfare. Ernest Borgnine is perfectly cast as Petrosino who comes across as a tough honest cop dedicated to cleaning up the Black Hand out of Little Italy and giving honest Italian immigrants the chance to become part of the American dream. Look for a young John Marley (Faces) as Caputo, the ragman. Ten years earlier there was another film called “The Black Hand” with the very Irish Gene Kelly playing a fictional young Italian named Johnny Columbo and J. Carroll Nash in a supporting role that was based on Petrosino. Of the two films, “Pay or Die’ is dramatically and historically the more interesting and more accurate. The film is well shot by cinematographer Lucien Ballard, who at times gives it a bit of a noirish quality (though this is no film noir). Ballard already had a long career behind him but would become best known for his later work with Sam Peckinpah photographing “The Wild Bunch”, “The Ballad of Cable Hogue”, “The Getaway” and “Junior Bonner.” It was directed, without flare, by Richard Wilson who just the year before made “Al Capone” with Rod Steiger another low budget though decent gangster film. 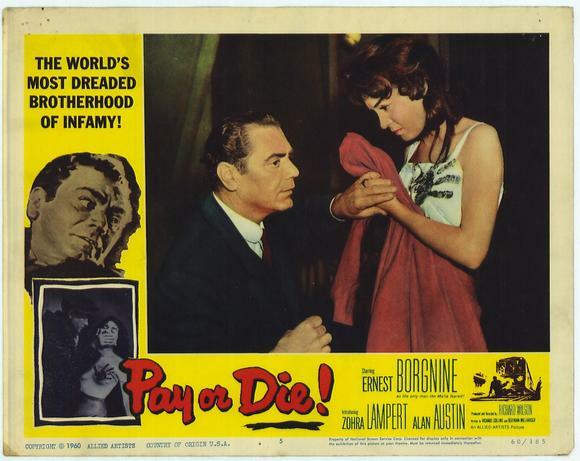 This entry was posted in 1960's, Film Reviews, Italian-Americans on Film, New York City Films and tagged Ernest Borgnine, John Marley, Pay or Die, Richard Wilson, Zohra Lampert. John, this is as comprehensive a review as I’ve ever read on this rather minor film, but it hits all the right notes. 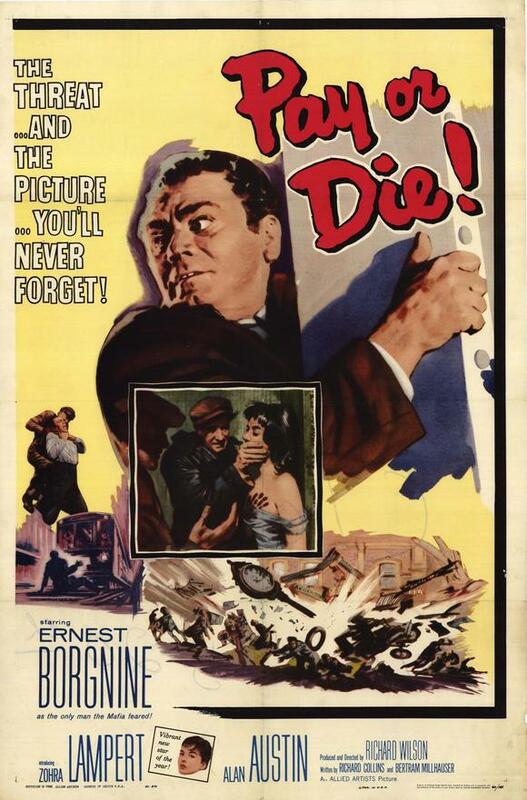 I do well remember that extortion business with Enrico Caruso, and the vivid portrait of the machinations of the “Black Hand.” Ernest Borgnine (whose best performance was his Oscar winning one in MARTY) is admittedly in his element here, and as you note Lucien Ballard’s photography is atmospheric. Excellent historical and sociological analysis of a rather underestimated if minor film. thanks Sam! A minor film it is but it tells a fairly accurate protaryal of what really happened and it is one of the few “gangster” films to show an Italian-American on the right side of the law. Totally off topic here John, but courtesy of Dee Dee I am on Cloud Nine right now, as I’m sure you will be!!!!!!!!!!! There is nothing I’ve wanted more than this for years!!!! Wow! this is great news. I definitely will have my order in asap. Thanks for the heads up. 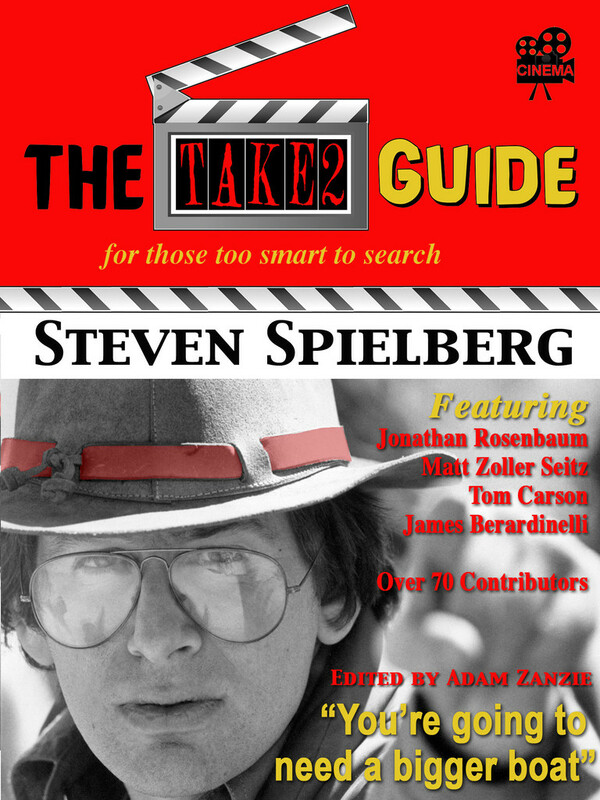 I enjoyed reading this about a film I have not seen… in fact, I knew nothing about this one outside of hearing the title and that it was about Joe Petrosino. Petrosino in general is an incredibly fascinating character. As I’ve mentioned many times, I’m a history/crime history buff, and there is a recently released book dealing with Petrosino and the Morello family that is outstanding… Ignazio Lupo (aka Lupo the Wolf), whom you mention in your review, actually worked with/for the Morellos. Anyway, the book is called “The First Family” by Mike Dash and was released only about a year and half ago. I can’t recommend it enough to anyone fascinated by true crime related stories or NYC turn of the century history. It is captivating stuff and goes into a lot of detail concerning Petrosino and his fateful trip to Sicily. Dave, I just looked this book up on Amazon and it looks interesting. Morello is completely new to me. Thanks for the information, I am going to order this tomorrow. I’ve been watching this film for over 35 years, and I must say that after reading this tremendous review I still feel that I’ve learned some things. As an Italian-American I was very thrilled to see a film that actually depicted some of us as the good guys. I also thought Borgnine gave one of his better performances. The film gives an interesting depiction too, of how the Italains picked on each other, the same way Don Fanucci was depicted in The Godfather Part Two. The Black Hand definitely targeted their own kind. Thanks again for your great comments!!! I always think of this film as one of the classic gangster films. Fine acting and cinematography. The review is well written. I remember the small part of Eduardo Ciannelli at the end as a highlight, though he seems ignored in the review. This true story still holds up and depicts the lower east side amazingly well having been filmed over 60 years after the facts. I sent a link for this page to EB. Who knows, maybe he will take a look. Thanks again, Angelo, that would be nice. Definitely remember seeing “Pay or Die” with my father when I was nine, and it really made an impression on me. Thanks for bringing back such an obscure item. You may be interested to know that NYC has not forgotten Petrosino. There is a small square dedicated to him in lower Manhattan with a very informative sign, I’ve seen it. Gary, thanks for the kind words and thanks for the link. It is good to know such men ar not forgotten. thanks for stopping by and glad you enjoyed the piece. 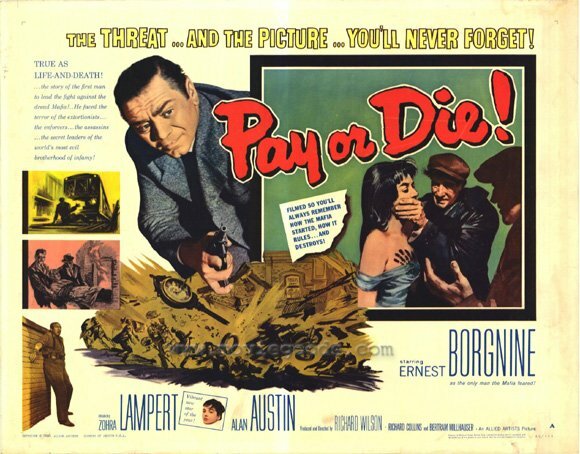 PAY OR DIE is available thru the Warner Archive. Below is the link.